Venture to Kwinana Golf Club on a Thursday afternoon and you are greeted by the sort of organised chaos that can help describe Western Australia’s growing worldwide reputation as a leader in producing golfing talent. Turn the corner past the impressive two-story clubhouse and he sight of 60 kids running around, gleefully clutching seven irons amid a lively hum of playground activity, is about the most unlikely vision you might imagine for a sport unfairly rendered to staid stereotypes of old suits and ceremony. In fact, what is going on at Kwinana is about as far away from institution as possible. That’s because the club is enjoying a boom in popularity amongst young children in the area after beginning its The First Tee programme two years ago. 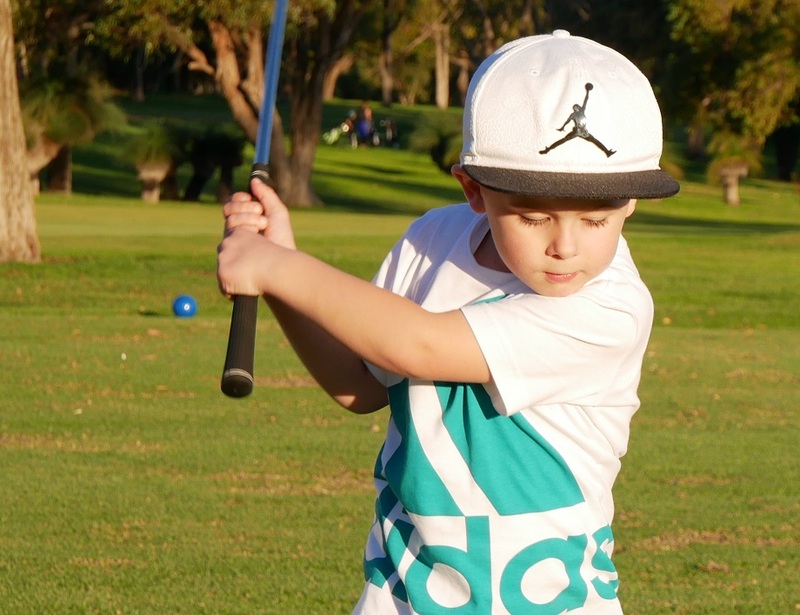 Since starting the initiative – a US-based curriculum that weighs life values equally to golfing skills – Kwinana has welcomed 238 golfers from as young as four-years-old to the course. Trish Glazbrook, who is tasked with co-ordinating the children and coaches as The First Tee Programme Manager, oversees an eight-person team of coaches and officials that includes Jess Whitting – who last year drove straight from her success at the WA Amateur Championship to coach the kids. That commitment is immediately obvious when you watch Kwinana’s staff work with the kids, from Tour professional Daniel Hoeve to coaches Joel Landers, Jason Ricetti, Brendan Rayner and Shane Foreman to programme managers Glazbrook and Ryan Upchurch. And the results are significant with Glazbrook estimating an average of 55 kids turn up each week. Best of all they do so because it has become the fashionable place to be. “I haven’t ever really needed to promote the programme,” Glazbrook said. “When we started we were told that we should only start with 16 participants until we found our feet and got comfortable. The first night we started with 36! “We’ve never had under 36 since and it just seems to grow. And the kids continue to turn up rain, hail or shine. “Yeah, rain is no deterrent for the kids. They love it and if it is wet I’ll just email (general manager) Brent Dawkins and ask if we can use upstairs in the clubhouse. “We take all the kids up there and set up putting activities – it gets pretty noisy! “One night we held it downstairs and the old gentlemen, with 40 kids putting around them, were just looking at us thinking ‘really’. But they’re great. They welcomed it and no-one complains. The benefits to Kwinana have already been obvious with the club fielding a junior girls pennants team for the first time ever this year and there are plans to expand on that in 2018. “We’ve had 14 kids who have graduated to being club members and playing pennants,” Glazbrook said. “But that was done in a bit of a rush at the end of last year with pennants starting on January 31. The impact of the programme is not felt in sheer numerical terms, however, with the significance of what the club are doing perhaps best reflected in the story of Caleb Whyte. The 12-year-old suffers from a form of muscular dystrophy but has become a regular at the classes over the past 12 months and has graduated to play on course. While Western Australia has developed a worldwide reputation for producing top-level talent in the likes of Minjee Lee, Curtis Luck and Hannah Green such stories underpin the relevance of grassroots endeavours. “He joined us in April last year and he has improved week on week,” Glazbrook said. “His sports teacher, who is also one of my part-time coaches, actually recommended that he join up and it has been so worthwhile. “Where he can’t play footy or rugby he has the ability to swing and club and participate and when you see him he achieves the skills in the same way that the kids around him are – he’s not hindered. The Western Australia Golf Federation (WAGF) has poured in $50,000 to help fund the initiative, in addition to commercial local support from the likes of Kevin Hammer and his team at GF Engineering. The money initially helped to launch the programme, which is based in the United States and which seeks to teach golf to children in conjunction with nine core life principles – honesty, integrity, sportsmanship, respect, confidence, responsibility, perseverance, courtesy and judgment. “Those core values are central part of what we do – we focus on one of those each week – but fun is an important part too,” Glazbrook said. “There’s little games to play and tasks to accomplish – it’s not just swinging a club. “The kids get pegs for doing what they’re instructed to do and following the core values. At the end of the session, and when they’ve got 10 points, they can help themselves to a reward out of the big reward bucket. “There’s opportunity for all the kids to be involved. The young ones start on the driving range and putting green and do 55 hours and then we assess their core values and ability. The programme is structured so that it is delivered in the same way across the globe, with centres in varied countries from Guatemala to Chile and New Zealand as well as across the US. Kwinana is the only First Tee International Curriculum Provider in Australia, and runs a 10-week programme during school term, from 4pm, at the cost of a gold-coin donation each week. It is easy to see why the kids keep coming back, and for parents Kwinana’s grassed areas offer an opportunity to roll out a blanket and relax in the late afternoon sun while Glazbrook and her team run a programme they were alerted to when former president Nick Noble was living in Florida. “He came back with the idea and he spoke to Shane, who is our vice-captain, and he presented it to the golf club and said ‘this is what I want to do’,” Glazbrook said. Community support remains critical to the success of the program with Kwinana on the look out for sponsors and volunteers in addition to the likes of Whitting, who now spends her time in the United States at Rogers State University in Oklahoma, but still mentors the girls while in Perth during her holidays. “We have limited funds and we’re currently looking for corporate sponsorship and things like that so we pick up equipment where we can find it cheap,” Glazbrook added. “We got a lot of these clubs off Gumtree. The club over there, quite a lot of them have been donated by members so we’ve cut them down to suit the smaller ones. For now Glazbrook and her team are preparing for the end of the latest 10-week run of classes, that will culminate in a ‘fun week’ on June 29 when the children are set to dress up as Minions from the Despicable Me films. “Coach Shane is going to dress up as the Purple Minion,” Glazebrook laughed. For a club that has spent the past two years dismissing old stereotypes – a golf course full of Minions is probably about par for the course. :: GolfWA is looking for new ways to grow the game at every level in the state and you can help by simply following us on social media. Please click on any of the links below and like us!